Voting has begun for Andrew Zimmern’s The Munchies over on Tablespoon.com, and even though it’s a national competition, quite a few Midtown favorites have been nominated. We’ve known for awhile that AZ is a big Biryani Cart fan, so it’s no surprise to see them nominated in the Best Food Truck category. But Salvation Taco is also nominated for Best Taco, Joe The Art of Coffee is up for Best Coffee, Momofuku Milk Bar is up for Best Bakery, Big Gay Ice Cream for Best Ice Cream, Shake Shack for Best Burger, and Brooklyn Brewery for Best Craft Brewery (they sponsored our 5th Birthday Party!) And wouldn’t you know it, Zach’s podcast “Food is the New Rock” (where he talks to chefs about music and musicians about food) is nominated for Best Podcast… so as long as you’re over there, you might as well vote for that also. You can vote once per day between now and April 30th. Go Midtown! Posted by The ML Team at 1:44 pm, April 16th, 2013 under The Munchies. 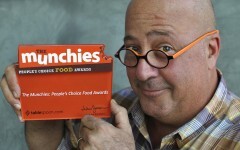 I don’t hate Andrew Zimmern, but there’s something about the combination of those glasses and that expression that really makes me want to punch him. I can’t explain it.